2 July 2014. Chemists from Princeton University and spin-off company Liquid Light Inc. in Monmouth Junction, New Jersey created a process to use sunlight for converting carbon dioxide into formic acid, a source for electric power and industrial chemicals. 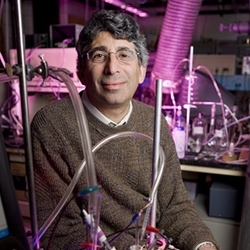 Princeton chemistry professor Andrew Bocarsly, also a founder of Liquid Light, and colleagues published their findings last month in the Journal of CO2 Utilization (paid subscription required). Formic acid, also known as methanoic acid, is a naturally occurring hydrocarbon used as a preservative and antibacterial agent, but also as a catalyst for industrial chemicals, and more recently studied as a potential source for hydrogen fuel cells. Bocarsly’s lab and Liquid Light are seeking ways to convert CO2 from waste processes into useful outputs, to reduce greenhouse gas emissions and — for Liquid Light — as a commercial opportunity. The researchers devised a stack of three cells with electrodes made of indium and iridium oxide. The cells were housed inside metal plates the size of lunch boxes, with channels to carry liquids. Public Service Electric and Gas, a New Jersey power company, provided a commercial solar panel used on its power line poles. The cells convert supplied CO2 into formic acid as an alternative transportation and stationary fuel source. Tests of the cells show it could generate a solar-to-fuel conversion efficiency exceeding 1.8 percent. According to the authors, this is the highest efficiency rate yet recorded for a lab device and twice the rate of natural photosynthesis. In addition to the commercial solar panel, say the authors, the system’s conversion cells used easily obtained parts. Liquid Light’s main business is low-energy and low-cost conversion of CO2 emitted in high concentrations from factories making fertilizers and cement into chemicals, such as ethylene glycol for producing polyester fibers and polyethylene resins in plastic bottles. In addition to feeding fuel cells, formic acid is easily converted into formate salts, a less corrosive and more environmentally friendly chemical for de-icing airport runways, providing another potential product line for the company.